Cutting Edge Services, Inc. is the leading commercial HVAC service provider in Los Angeles, San Diego, Orange, Riverside and San Bernardino counties. But we do far more than design and install the best, most efficient, HVAC systems available: our experts provide a range of services to help meet all your heating, ventilation or air conditioning service needs, no matter whether your HVAC system was designed by us or another company. Air conditioner service: Our expert service techs know the ins-and-outs of virtually every air conditioner out there. Whether it’s a simple repair like adding freon or one that requires special expertise, our tech gets it done quickly, efficiently, and in a timely manner. Heating service: Customers often don’t realize their heating system needs to be repaired until the first cold snap of the season. Our expert techs quickly determine the problem and solve it quickly so you can get back to work. Clean rooms: Pollutants, mold, dust and bacteria can become trapped in equipment components if the equipment is not properly maintained. Our expert techs can help you maintain your CR Lab air quality and create a safe, more conformable environment for everyone. Reduce risks and hazards. Stay compliant. Green technology: Our expertise, coupled with our knowledge of the most eco-friendly green HVAC systems can help you save money while maintaining a healthy work environment and helping reduce your carbon footprint. On-going HVAC system maintenance: Cutting Edge Heating & Air Conditioning can be your “in house” HVAC maintenance and repair specialist. With regular maintenance and check ups, our tech helps you prevent expensive repairs by identifying issues before they happen. Process Cooling: servicing process cooling system requires a higher level of expertise. Our technicians are experts in the industrial cooling systems. Schedule HVAC service now. Our techs are available 24-hours a day, 7-days a week for air conditioner service, heating service, unit maintenance and more. Our expertise is unmatched in the industry, and we’re committed to providing the best service out there for your company. Cutting Edge Services, Inc. has a variety of maintenance and service programs to choose from to make sure your system works effectively, efficiently, and without interruption. Looking for eco-friendly HVAC systems for your business? Cutting Edge Services, Inc. is ahead of the curve. Conserve energy. Save money. Call us: 310-344-8817. Cutting Edge Services, Inc. has more than 20 years’ combined experience as clean room specialists. Reduce risks and hazards. Stay compliant. 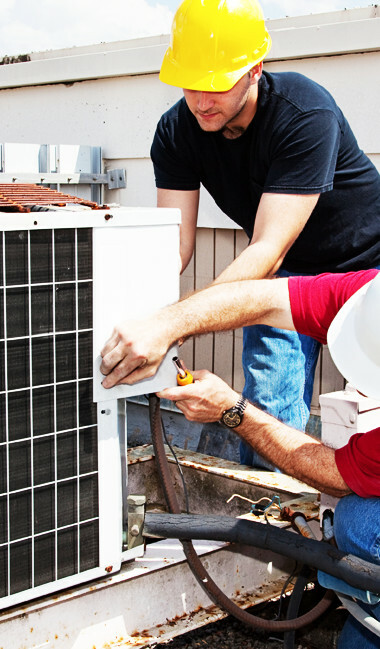 We’ll repair your AC so your employees can perform at their best. We’re a full-service company handling everything from sheet metal projects to process cooling. Let CESI be like your “in-house” AC guy. Our low-cost maintenance programs include priority service during heat waves. Prevent breakdowns. Save money.